On Tuesday, April 5, 2016 the Michigan Developmental Disabilities Council invited the public to give input on the topic of sub-minimum wages being paid to people with disabilities. Two of our staff members, Joanne Johnson (from our St. Joseph office) and Miranda Grunwell (from our Kalamazoo office) traveled to Lansing to provide public input on behalf of Disability Network Southwest Michigan. What follows is a summary of the issue and a personal description of the experience of giving public input. The Michigan Developmental Disabilities Council (DD Council) is a statewide organization made up of interested individuals appointed by the Governor. The DD Council advocates for the rights and inclusion of people with developmental disabilities so that people with disabilities can reach their full potential. They advocate by supporting or opposing legislation that affects people with disabilities, researching policies, giving out grants for organizations to provide trainings, and supporting groups of self-advocates to make changes in their local communities. They work on issues like housing, transportation, health care, and economic justice. Within the DD Council there is a committee that decides what legislation the Council will support. There was disagreement within this committee regarding the practice of paying people with disabilities sub-minimum wage. There is a federal employment law from the 1930s that is called the Fair Labor Standards Act. One part of this law (Section 14c) allows businesses to apply for, and get, a certificate that lets them pay people with disabilities less than minimum wage. Some people say that this helps people with disabilities get jobs. Some people say that it’s not fair to pay people less than minimum wage just because they have disabilities. The DD Council decided to hold a public hearing to find out what people in Michigan think about the issue. Public hearings are where committees listen to the opinions of people who are affected by a decision or who care about the decision. Having a public hearing can be an important part of thoughtful decision making. Anyone can come to a public hearing – it’s a great way to let your opinion be heard! 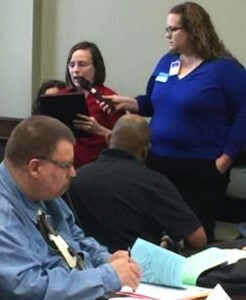 Joanne and Miranda traveled to Lansing where the public hearing was being held to let them know that Disability Network Southwest Michigan thinks that everyone should be paid at least minimum wage, whether they have a disability or not. 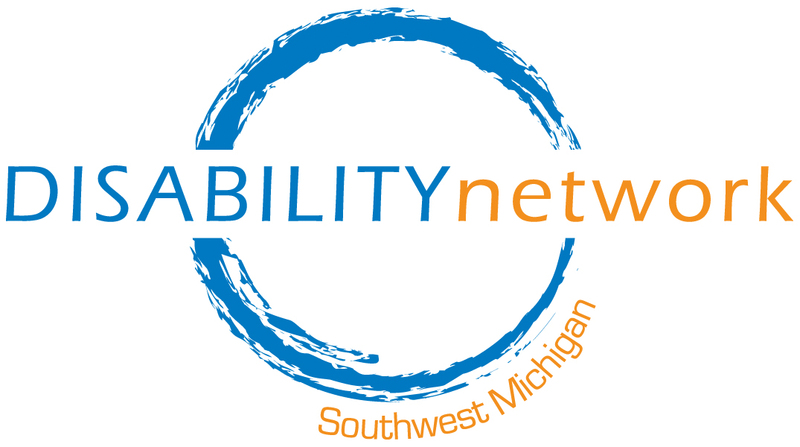 In their case, they appeared on behalf of Disability Network Southwest Michigan, but they could have appeared on behalf of themselves as individuals. Click to download a transcript of Joanne & Miranda’s public input. Public hearings can vary a bit but in general they all have spaces for the committee members to sit and spaces for the public to sit. They are in accessible locations and near a bus line, if there is one. And they have to let everyone participate unless a person is being disruptive. In this particular public hearing, the public sat in chairs along the walls of a big conference room and the committee members sat in the middle. After the committee agreed on the agenda for the meeting, they passed a microphone around to hear everyone’s public comments. There were about 20 people present to give input, and they wanted everyone to have time to speak, so they gave us a time limit of 3 minutes each. Some people talked for the whole 3 minutes, while others talked for just a few seconds. Some people were sharing their own personal stories of working for less than minimum wage, and others were talking about the work their agencies do. Some people were in suits and ties, some people were in jeans and t-shirts. Both sides of the topic were represented. Most people in this public hearing said that they thought that people with disabilities should make at least minimum wage. Many people said they thought the law was outdated and not fair to people with disabilities. A few people said they were worried that people with disabilities wouldn’t be able to find jobs because employers wouldn’t want to pay them minimum wage. When they were done, a committee member took the microphone, thanked them for their input, and passed it to someone else. No one had any comment regarding Joanne and Miranda’s input which is pretty typical—the committee members usually don’t respond or talk about the comments until after all the comments are done. After all public comment was heard the DD Council committee members had a long discussion about everyone’s comments. They shared their thoughts and talked back and forth about the issues. Some people were worried that their family members wouldn’t be able to find jobs if they supported paying everyone minimum wage. Some people were certain that it was time for everyone to earn minimum wage. After their discussion, they took a vote. Nine people said that the DD Council should support legislation paying at least minimum wage to everyone. One person said the DD Council should not support legislation. Two people passed, opting not to vote on the issue. The final vote was 9 to 1 in favor of the DD Council supporting legislation that pays people with disabilities minimum wage statewide. This means that if someone drafts state legislation (a law for Michigan) that says that people with disabilities should be paid at least minimum wage, the DD Council will support this law.